After data is ingested into Hull, it is used for computation. The Compute stage is about calculating the difference or “diffs” between User or Account Reports and the existing indexed data. This is used to create User and Account Report Notifications to publish updates. The associated User or Account objects are then marked as “dirty’ and recomputed. You can view and manage Attributes in the Attributes view on the Dashboard. Visible Attributes will be ingested and visible in the dashboard, but no Attribute Changed events will be emitted. Warning: Tracking Attributes Changed Events can create a lot of billable Incoming Requests. You can also create infinite loops with any dependent timestamped attributes. Best practice is to limit this only to Attributes where you use the change in values to run computations. When one or more attribute marked as visible + tracked are changed, Hull will generate an internal Event named Attributes changed that contains the previous and new value of the attribute. You will be able to use the Attributes Changed event in the Segmentation engine to filter users. If more than one attribute was changed by one connector, you might see multiple from/ and to/ properties in the same Event. Different connectors will always generate different Attributes Changed events even if they happen at the same time. Segments are used to group Entities who share common sets of properties and/or behaviors. You can create User Segments and Account Segments. Segments are built via the Segmentation Tool in the Dashboard. Segmentation queries are built from predicates. Predicates can be combined with “all” (AND) and “any” (OR) logic, visible in the query builder. equals does_not_equal Equals, Is not equal to Strict equality of the whole string. Case sensitive. contains does_not_contain Contains, Does not contain Partial match within the string (tokens). Case & diacritics insensitive. is_before is_after is_between Absolute > Is before, Is after, Is between Strict absolute inequality comparison with a given date based on UTC timezone. is_exactly is_less_than is_more_than is_between_days Relative > Is exactly, Is less than, Is more than, Is between Relative date comparison in whole number of days. Every Event query has an Occurrences and Timeframe filter. You can query Event Properties beneath each Event query with the “Where” button. between_days Relative > between Relative between 2 values of “Days ago”. Any Event properties that have ever been associated with the selected Event will be displayed in a dropdown. This also includes the default Event Properties that Hull adds. after before After, Before The Event Property is a date, either after or before the given date. You can combine combinations of AND and OR with Nested predicates. These are displayed as “Groups” within the Segmentation Tool query builder with all and any filters. Learn more about how data is ingested in Hull. Segments with relative time predicates — “Users signed up less than 7 days ago” — are treated as live Segments. Unless there is any other new data, all live Segments are recomputed on a rolling basis at least every 6 hours. When a Segment is created, updated (and saved in Dashboard), or deleted, a Segment update notification will be generated and emitted. - A few seconds after, new Memberships will be computed onto your Entities for this updated segment rules. - A notification will be sent to connectors so they can update Segment objects in third party tools (e.g. Facebook Custom Audiences, Mailchimp Lists). Read more about Updates in Notify. When an Entity enters or leaves a Segment, a Segments changed event is captured in their timeline. 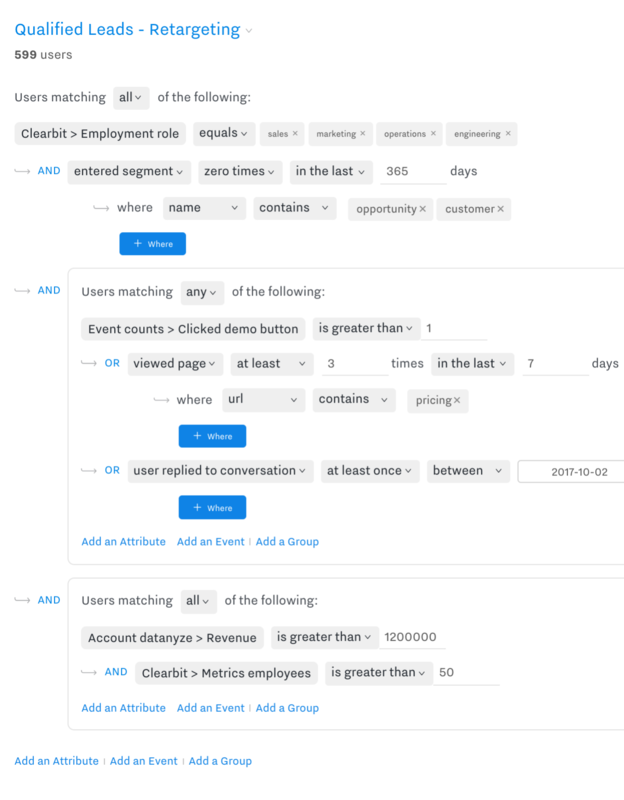 Segments changed events are one of three triggers for User and Account Updates. entered: The names of the segments that the User entered. left: The names of the segments that the User left. entered_ids: The IDs of the segments that the User entered. left_ids: The IDs of the segments that the User left. Days since Signup: the number of days elapsed since we had an email stored from that User Profile.